Among the most strenuous decisions you have to make when building a plywood boat is what type of plywood to buy. Price differences can be tenfold, if you want. What makes things difficult for an enthusiast, tenfold more than with epoxy, is the variety of opinions. 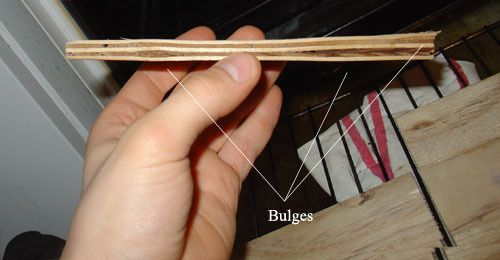 What type of wood to use, how thick, what sheet size, which glue should the plies have in between, which company is the best, where to get it cheap, should I epoxy both sides. 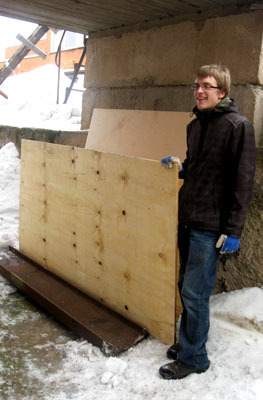 How to test my plywood? So on, so on… We will discuss how we arrived at our decision to use boil proof Brazilian pine plywood, which is about the cheapest we could get. We decided to use cheap plywood mainly for two reasons. Boatbuilders have argued that non marine-grade plywood boats delaminate and rot fast. On a spring day, we decided that we are young and crazy students and hell knows what we will be doing in, say, four years. Saving three times the money we would spend on the certified wood is worth it. Let it rot, we’ll build a new one. Okay, it is not that drastic. We will not be sailing all year round. Our sailing season lasts maybe four to five months. During the rest of the year the boat will be hauled out of the water, into a protective environment. The second argument is that we will be glassing the whole boat, including most of the inside, with a heavy grain cloth. Two layers of epoxy, at least. Water does penetrate epoxy in time, but you have to push it in order to achieve effect. Plus, we are planning on creating a ventilation access to all the possible cavities in the boat, to prevent rot. 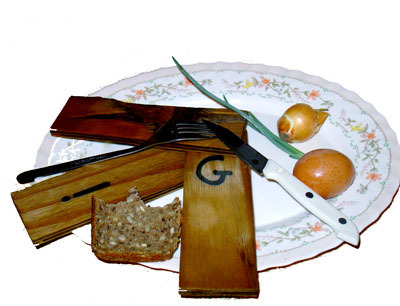 We were also influenced by local boat builders who had used the same plywood-and-all-epoxy approach with great success. We’ve been out sailing with one of these fine boats. On the other hand, they say that fully epoxying a marine grade plywood boat is not necessary. In the long run, the cost of epoxy might add up to a good stack of marine grade wood. Again, it is up to you. So far, we have saved money with using our approach, we’ll see how it works when on water. After making decisions, actions followed. We had to decide which cheap plywood to buy. We asked around and got some recommendations. We searched the Internet for some addresses and went for a bike trip. At the preferred storage we asked for a few surplus pieces. The salesman was glad to hand us some pieces after hearing what we intended to build. Not being sure of the quality, we decided to boil and cook the wood. The procedure was carried out in a straightforward fashion. 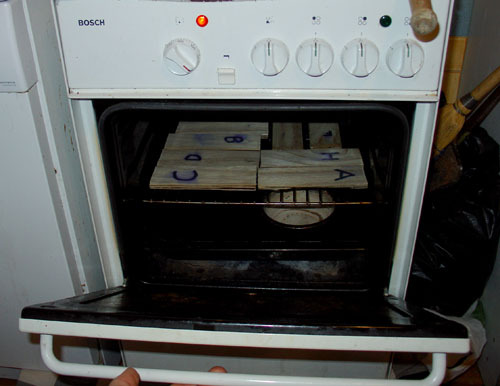 We had 9 equal size plywood pieces which we boiled for 20 minutes and then cooked in the oven at 300 C for another 20. This cycle was repeated ten times. The material we use is Brazilian water/boil proof plywood. Nine equal sized plywood plates before their initiation into a harsh boiling life. This is how we boiled them. 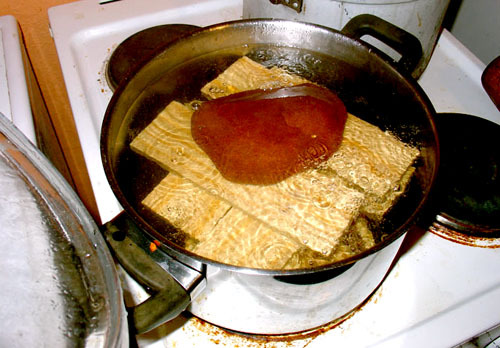 The stone was added on top to keep the plywood soaked, as the mixture boiled with vigor. After completing this procedure we found that no delamination had occurred on any of the test subjects. We can not draw final conclusions yet about our solution, since the boat is not on the water yet. We’ll update once that has happened. Is the boil proof brazilian pine plywood a marine grade ply? Is it stamped with any quality details? I am currently finishing a Bolger Micro. You can see it in the yahoo/bolger website in the folder “Rods Micro”. A sheet of marine grade ply is $180 here in Australia for a 9mm sheet, 8 foot x 4 feet. Very expensive. How does your ply compare? Well, our plywood is not marine grade, not stamped. Our testing cycle consisted of boiling our test examples (20 min) and then putting them into the oven (300 C) (20 min). This cycle was repeated perhaps 10 times. We did not notice any delamination. Only bulging at the overlaps of sheets. My test examples were boiled 5 months ago and they are still fine. I will write more on the plywood when the time is right, together with pictures.